I love my mom for many reasons. But, I especially love it when she comes to visit and I wake up to a yummy local breakfast, and a clean stove. Apparently I do did not inherit the gene that motivates you to wipe down the stove after every meal (or the one that makes you fold laundry straight out of the dryer) I decided to demonstrate my daughterly appreciation with some limited edition Mendocino grown candy cap mushroom ice cream. Disclaimer: Writing recipes is hard because we don’t often use them, or modify them so much at whim that we don’t exactly remember what we did, but we’re just happy it’s not totally gross. We have, however, made this ice cream so many times that we have something that closely remembers a replicable recipe. When I am less than exacting or if things don’t turn out as I hoped, know I am not withholding my secrets – just admitting a highly improvisational approach to cooking. You might finding it liberating to find out that it’s hard to screw up most things. 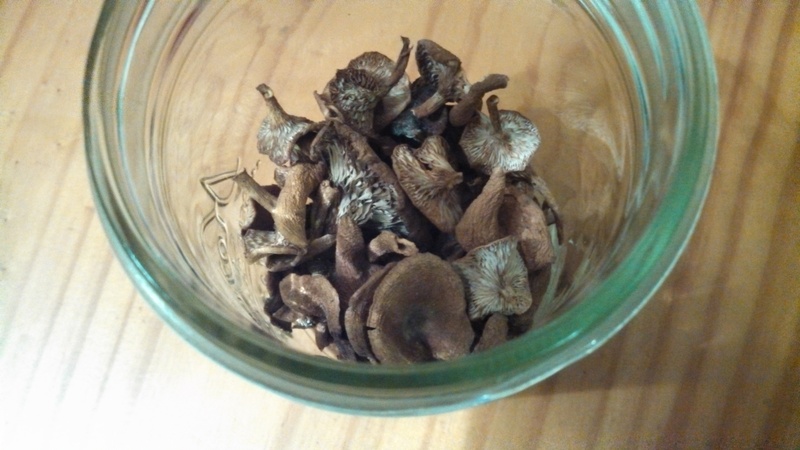 For those of you who are not familiar of the wondrous candy cap mushroom, welcome. They have the scent and flavor of maple syrup and grow abundantly in the woods on the Mendocino Coast. We harvested ours last winter and dried them. Sadly I am down to the bottom of the jar, because we love this ice cream so much. Good thing berry season is here. 2 cups of milk (we like it whole and fresh). This is the right amount for my ice cream maker – depends on your machine. An ice cream maker. This is the Cuisinart that I have and I’ve been really happy with it. A blender or coffee grinder. 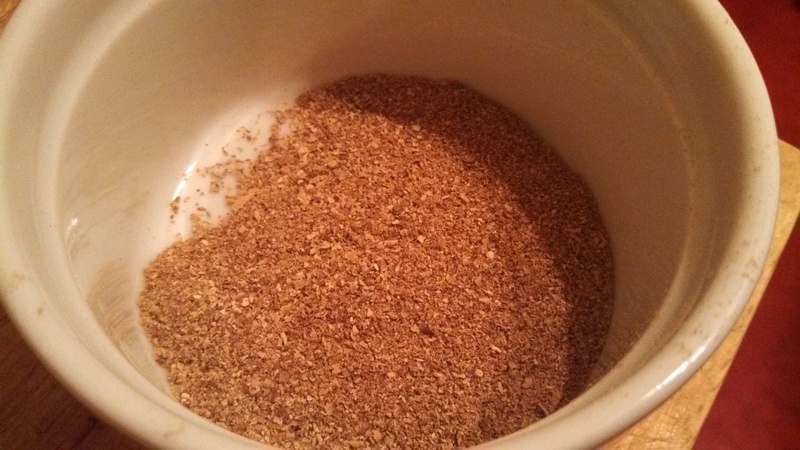 Begin by grinding the candy caps in the blender or coffee grinder. I use my Vitamix for this, which powders them really nicely. Heat two cups of milk in a saucepan until the edges are just starting to simmer. Don’t let the milk burn, as always. While milk heats, beat 3-4 eggs in a bowl with 2 Tbsp+ of honey. I have started adding a bit more honey. Beat well until blended. *Slowly* pour the warm milk into the eggs, whisking continuously. Add candy caps to the mixture and whisk everything together. Pour the egg/milk mixture back into the saucepan and heat on low, stirring constantly with a big spatula. You may need to lift it off the stove to control the temp – you want it to thicken, but not curdle. This is the only delicate part of the process. Stay alert. *If* it starts to curdle, take it off the heat immediately and whisk vigorously. It’s probably thick enough once this happens. Chill the mixture, ideally overnight, in the fridge. In an ice cream emergency, an ice bath will do. The results are much better when the ice cream mixture has cooled completely. 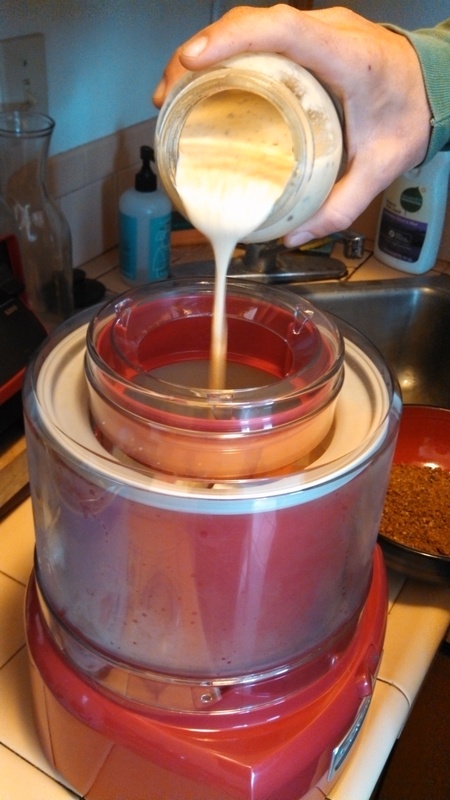 When ready to make ice cream, pour into the ice cream maker. Turn on and let the magic happen. I think it usually takes about 20 minutes. Categories: Dairy, Recipes | Tags: candy cap, Cuisinart, eat local, honey, ice cream, locavore, mendocino, milk, mushroom, wild mushrooms | Permalink.